If you want to add value to your home while increasing living space at the same time, there are so many options. After all, moving costs make buying a larger home somewhat unrealistic, so improving rather than moving makes good sense. It is no coincidence that making your home bigger (or even just so that it feels bigger) will add value so enhancing space is a common priority. If you already know you want to extend your home, read our complete guide to extending a house, but you might be surprised by what can be done within the existing footprint. So, whether you're investing in your home with the addition of an extension, loft conversion, basement conversion or by reconfiguring the layout of your home for a more open plan feel, find out how to add space to your home, increase your quality of life, and make your home more sought after. You don’t always need to extend a house to increase the space in your home; sometimes it’s the layout or room size that is wrong. Improving the spatial flow or maximising the views to the garden can add tens of thousands in value if done right, but take structural advice before you start. An architect can offer suggestions for improving an open plan layout, perhaps by removing internal walls to open up a through living room or a kitchen-dining space, or to create a larger room from several smaller ones. Use our guide to create a successful open plan layout in an old home. 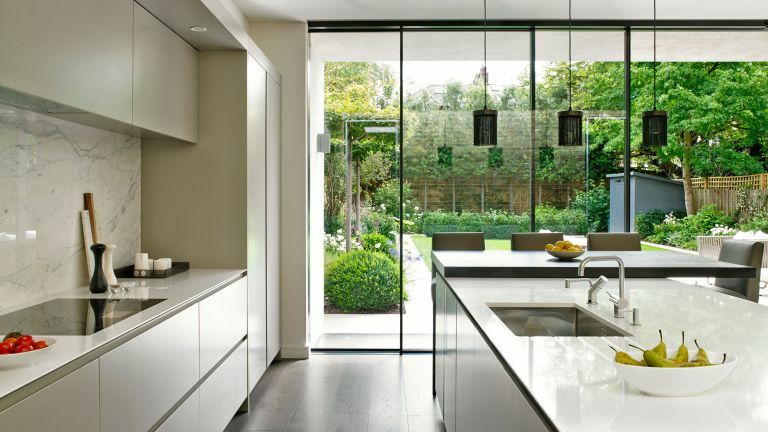 One of the most popular home transformation projects is knocking through between an existing kitchen, dining and living room to create an open plan kitchen diner. This is better suited to our modern lifestyle of treating our kitchens as the hub of the home, not only for eating and cooking, but relaxing entertaining and family time too. Expect to pay £400 to £600 for a stud wall to be removed and made good. If the wall is load bearing, you’ll need to speak to a structural engineer, who will advise on installation of supporting steels, this is likely to cost upwards of £2,000. Be aware that relocating your kitchen sink, dishwasher or washing machine will incur extra plumbing costs. And factor in designing a new kitchen, which will cost upwards of £5,000. Make sure that your new kitchen is accessed directly from the hallway, as you don’t want to have to walk through other rooms to get to it. Also consider putting the kitchen itself in the darkest part of the room, as this is where you will spend the least time and it will need plenty of artificial task lighting anyway. It makes far more sense to put the dining or living areas closest to the windows where you can sit and enjoy the views. If you don’t want to go completely open-plan, consider installing sliding pocket or bi-fold doors between rooms, which will enable you to open the space up or close it off as and when required. Sliding pocket doors typically cost from a couple of hundred pounds for a single door kit, up to thousands for glazed bi-folds. In a sizeable home, if you spend £20,000 on a new kitchen appropriately, you could add £50,000 in value to your property. Take a look at our guide to cutting the cost of a new kitchen to achieve a stylish finish on a budget. If you have gone down the open-plan route, finding space to add a utility room can be a great practical addition. It keeps the noise of white goods out of the living space and gives you a place to hide away laundry and cleaning gear. New stud walls cost between £400 and £600 to install and can section off an unused area of your kitchen to create a utility. Although it’s usually best to have direct access to the outside from for muddy boots and coats, you don’t technically need any doors or windows in a utility room, although you will need to factor in ventilation. If space is really tight, you can even fit a utility space into a cupboard in another room or within a wide hallway. See our small utility room ideas for inspiration. If the under-stairs cupboard is used as a dumping ground, measure it up and consider stacking your washing machine and dryer. Installing a worktop in a storage cupboard can create a handy work station. If there is potential to add plug sockets, you could free up kitchen worktop space by moving appliances. If you are fitting out a utility room to match the kitchen, expect to pay from £2,000, including plumbing and wiring. Find out more about designing a boot room and look at clever ways to repurpose your under stairs space. If your house has single glazing, consider having double or even triple glazing (if there is outside noise), as it will improve the warmth and energy rating of your home. If they were double-glazed more than 15 to 20 years ago, the windows may no longer be performing well, or the seal could have gone in the unit. In this case, they will probably need replacing. Choosing new windows in keeping with the style of the house can enhance its external appearance considerably. With a cost of £25,000, glazing your windows will add up to £60,000 to the value of a four bedroom property. You may also consider adding windows to increase the amount of incoming light, especially in north-facing rooms. Installing new or bigger windows, choosing sliding or bi-fold doors can make your home feel bigger and brighter, too – find out more in our guide to maximising daylight in your home. Rooflights are especially effective for filling a space with natural light. Alternatively, try to add a window where the best light source is available, opting for obscure glass if the new window will be facing a neighbour’s house. Check with the duty planner at your local council before proceeding with installation. With a cost of £2,000 per new opening, a new window will add at least £5,000 in value to your property. A loft conversion will offer additional space for an extra bedroom, home office, or playroom. A dormer extension will give you extra headroom, but position these to the back of the property rather than the front or side, so that they are less visually intrusive. With an average cost of a loft conversion being £30,000, an additional room could raise the value of your property by £50,000. A simple room-in-roof conversion, using just rooflights and no dormers, will cost even less so it is one of the most cost efficient ways to add value to your home. Installing efficient central heating reduces energy bills and is appealing to future buyers. Upgrading doesn’t always mean you need a new boiler. Some plumbers dismiss older models because they aren’t familiar with them, so get more than one opinion. Cast iron radiators look attractive in a period home, but, to economise, you could reserve these for the ground-floor rooms that are on show, then use steel or aluminium models elsewhere. If you are investing in a new boiler, consider a combi option in houses of up to four bedrooms. A pressurised system is normally best in larger properties, or those with low incoming water pressure. A new boiler will cost you £2,000, or up to £10,000 if you include new pipework and radiators. New central heating could add £15,000 to the value of your home. Find out more about central heating in our dedicated feature. En suite bathrooms are a desirable addition to any home, but be aware that for resale they do need to include a toilet, so you will need to consider the drainage. Be wary of compromising too much space in the bedroom or you will lose the impression of a luxury master suite. With a cost of £10,000, an en-suite will add up to £30,000 in value to your home. It can be possible to squeeze an en suite or bathroom into an existing bedroom, and still have a workable room where a bed can be placed. If you are doing this in a loft room, use the space where headroom is slightly lower for the foot end of a bath or for bathroom storage. On the ground floor, you may be able to make use of the area under the staircase for a toilet. There might also be room on a large landing to squeeze in a shower or extra cloakroom. New stud walls cost between £400 and £600 to install. You’ll need to factor in plumbing costs, which are around £500 each for a new sink, WC and shower. Find out more about adding a loft en suite. A master suite that combines sleeping, bathing and dressing areas is the ultimate must-have in a busy family home. Master suites are not only highly desirable, they’re also the perfect solution for repurposing an awkward set of rooms that don’t quite work as separate spaces. You needn’t combine three rooms into one, either – a cleverly planned dressing room, bathroom and bedroom within two existing rooms can work just as well. If yours is a period property, it is likely that there’s already a bedroom next to the master bedroom that you can knock through to, and use as the en suite/dressing room. Or, if you have a large landing, you may be able to erect a partition and doorway to make a small lobby leading to both rooms. Expect to pay between £400 and £600 for a new partition wall. An installed bathroom suite will cost upwards of £3,000. Budget around £2,000 for fitted furniture. Use these master suite design ideas to inspire your new room. Give an underused spare bedroom a definite purpose – whether as a games room or home office – to create a useful space. Designing a home office will require careful planning: you'll need plenty of sockets, a phone line and an internet connection, as you will if you're planning a hobby room. How to create a home gym? For starters, you'll need sockets for equipment, perhaps a TV and sound system, plus good ventilation. Creating a home cinema room, setting up a crash pad for teenagers or a games room will have to accommodate anything from a simple TV and sound system to a Blu-ray player, film server, DVD player, games console, projector and speakers. If noise is an issue, it may be worth lining the room with acoustic-grade plasterboard or wall panels, and fitting sound-proofing strips to doors. Electricians charge from around £50 to change a light switch for a dimmer, and from around £120 to fit extra double sockets. Acoustic carpet underlay costs from around £120 for a W137cm x L1100cm roll; acoustic mineral wool for cavity insulation costs from £3.50 for a W60cm x L120cm slab, both by Sound Service. It can be tricky to disguise what a converted garage once was, but don’t let that put you off as they are great for creating extra ground-floor space without the cost of an extension and, with good design, a garage conversion should blend seamlessly with your existing property. A garage conversion can be used to extend your kitchen into an open-plan kitchen-diner, or as a playroom or media room. Expect to pay from £850 to £1,150 per square metre for a basic conversion. This means it could cost you upwards of £20,000, so a garage conversion isn't cheap, but it could add £50,000 to the value of your property. Find out more about converting a garage in our guide. The first consideration here is drainage; if you can’t site the toilet on an outside wall or where it can connect straight to the mains, don’t do it. Avoid macerators as they are noisy, easily blocked and won’t add value at resale. Ensure you site a downstairs toilet in a convenient place, ideally leading off the hallway and with an outward-opening door. Make sure that adequate space has been left for a hand basin in order to abide by building regulations. With a cost of only £2,000, a downstairs toilet will add £10,000 in value to your home. Any outside space comes at a premium, particularly in an urban area, and will add value to your home. Aim to provide outside space where the light is best – especially useful if your main garden faces north. Make use of a flat roof to gain valuable outside space, or install decking and lighting, which could add £10,000 in value to your property. The cost of installation will depend on what needs doing and what structural changes need making. You can learn more about designing a rooftop garden in our guide. Use these ideas to dress your balcony to best effect. If nothing else, you need to ensure there is adequate insulation as this will improve your energy rating and reduce heating costs. If you have old concrete roof tiles, changing them to slate will add value and enhance the appearance of the exterior. Roofs last a long time – a new one is a great selling point, as potential buyers won’t need to worry about replacing the roof in the near future. Find out about maintaining a roof in our guide. Replacing the roof will cost £15,000 and could add £40,000 to the value of your home. A new driveway could add £10,000 to the value of your home. First impressions count, and your property is unlikely to be attractive to potential buyers if the first thing they see is a tired front path, or a front door that hasn't been painted for decades. Consider renovating or at least repainting the porch, the front door, and the windows, or giving the brickwork a good clean. Find out everything you need to know about transforming your home's exterior. Do you have a ground-floor room with a pitched roof? Removing the ceiling to roof height will make the room feel instantly bigger and brighter, as will adding roof windows or installing a large wall of glazed doors linking to your garden. The feeling of space can be as important as actual footprint when it comes to value. Incorporate better storage into and throughout your home to make it feel tidier and therefore larger. In a living or dining room, for example, consider floor-to-ceiling shelving to create a home library and display space; in a hallway, find a neat space to stash coats and shoes; and in kids' rooms invest in good toy storage. If you had to choose between a property where the toilet flushed properly and one where it didn't, which one would you go for? Think like a prospective buyer and invest into fixing any small issues that just might make that difference when it comes to selling your home. Doors that stick, loose handles, chipped paintwork on skirting and the little things you have stopped noticing will leap out to someone viewing a home. These are the top 25 DIY fixes everyone should know how to tackle. If you have room in your garden, building an annexe or adding a garden room can add valuable living space – whether for guests to stay over or teens to hang out. What you choose to do may be governed by planning permission and will possibly require building regulations sign off, so do check with your local council before proceeding. Adding a single storey extension can add lots of extra living space and value to your home, and can be used to create a larger kitchen diner, utility room and an extra reception room. More cost effective still is a building a double storey extension. With the same footprint as a single storey extension, you can add twice as much new interior space but, since you're only paying out once for foundations and roofing, the cost per square metre will be lower. Use our expert guides to find out all you need to know about designing, planning and costing your extension projects. Melanie Clear is the founder and director of Clear Architects. With experience in both commercial and residential architecture, she believes that great design takes careful though, vision and a deep understanding of a building’s structure.